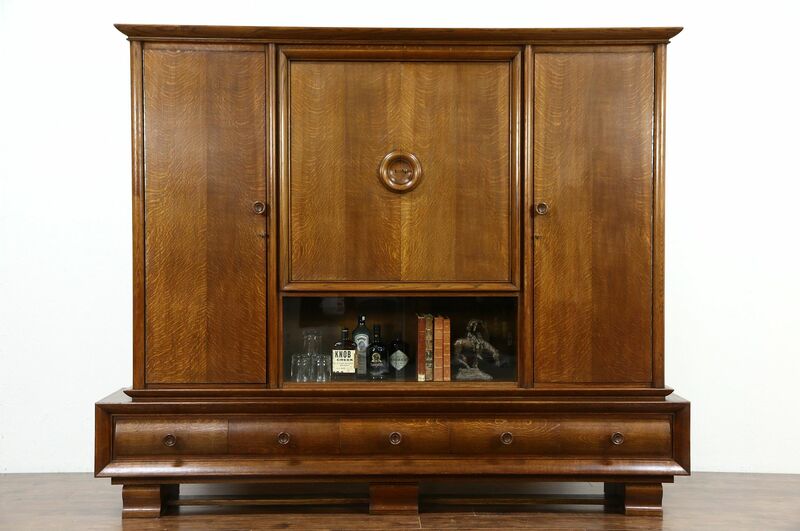 A sleek Art Deco library cabinet with armoire and bar from about 1920 was hand crafted of oak in Scandinavia. The original finish is very well preserved and has been waxed and buffed, all that is needed to maintain its soft luster is an occasional wipe with a soft dry cloth. Locks and keys work, doors swing on piano hinges. Drawers have hand cut dovetail joints. The bar cabinet has sliding glass doors. Open files on the right have removable dividers and the shelves adjust on wooden supports. The left closet door has a slight warp from age, see photos. This antique office furniture is two separate pieces for easier delivery. Dimensions are 94 1/2" wide, 19" deep and 78 1/2" tall.